The Dialogo Nacional por la Paz: El Salvador committee is Laura Dominguez's first foreign language committee experience. Portraying a violent gang leader from El Salvador is not an experience many Model UN delegates get to have, especially when speaking a foreign language. 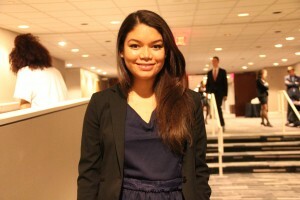 For Laura Dominguez, the Dialogo Nacional por la Paz: El Salvador, 2012 committee at the 61st Harvard National Model United Nations Conference is her first foreign-language committee experience. Dominguez, who was born and raised in Colombia, is fluent in both English and Spanish, the latter of which was her first language. While Dominguez has attended several conferences before, this is the first committee where she was able to debate issues with fellow delegates in Spanish. “I wanted to be able to experience MUN as a Latin American student, and doing a committee in Spanish would allow me to do so,” Dominguez said. In the Dialogo Nacional por la Paz committee, all of the delegates are fluent in Spanish, and all of them are native-born speakers. Dominguez has seen a difference in how the committee is run as a result of the high number of Spanish-speaking delegates. Dominguez has loved the committee so far and is excited to participate in more committees spoken in foreign languages.